THE HAGUE, Netherlands Libya insisted Tuesday that it should be allowed to prosecute one of former Libyan dictator Muammar Qaddafi's sons, telling international judges that trying him at home will be "a unique opportunity for national reconciliation." Libyan lawyer Ahmed al-Jehani spoke at the start of a two-day hearing at the International Criminal Court that will go a long way to deciding where Seif al-Islam Qaddafi will be put on trial for crimes against humanity  in Libya or The Hague. Seif al-Islam is charged by the international court with crimes against humanity for his alleged involvement in the deadly crackdown on dissent against his father's rule. 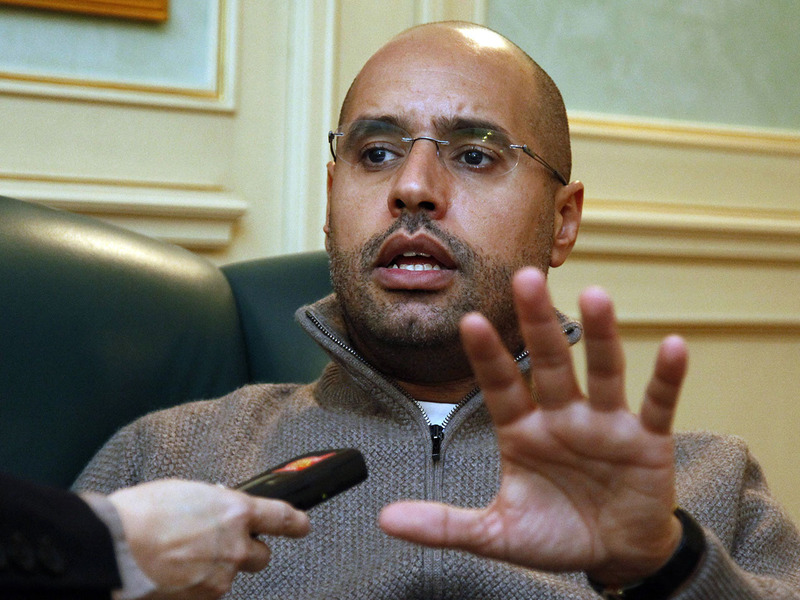 Where he ends up being tried is not only a matter of national importance to Libya's new rulers. It's also of huge consequence to Seif al-Islam himself: if he were to be tried and convicted in The Hague, he could face a maximum life sentence, but if a Libyan court were to find him guilty he could face the death penalty. Prosecutors in The Hague who originally indicted Seif al-Islam last year now also believe Libya should be given the chance to try him. Prosecution lawyer Sara Criscitelli told judges, "We are confident that Libya is interested in prosecuting these crimes and this offender." While prosecutors and judges are both part of the court, they operate independently of one another and judges do not have to follow the prosecutor's advice. Libyan authorities who captured Seif al-Islam last year insist that the international tribunal's own rules allow them to try Seif al-Islam. Under the Hague-based court's founding statute, it can only step in if a country where crimes were committed is unable or unwilling to prosecute, a legal principle called complementarity. Court-appointed defense lawyers for Seif al-Islam have cast doubt on whether the fledgling legal system set up in the aftermath of the collapse of Qaddafi's four-decade dictatorship can give Qaddafi's son a fair trial. In a written filing, they say Seif al-Islam wants to be tried in The Hague rather than facing a court in Libya. "I am not afraid to die but if you execute me after such a trial you should just call it murder," he was quoted as saying. The defense lawyers are expected to address judges later Tuesday or Wednesday and urge them not to send the case to Tripoli. Libya remains in turmoil almost a year after Qaddafi's ouster and rival armed militias still pose a serious threat to security in the country. Seif al-Islam is being held by a militia in the town of Zintan. But al-Jehani said prosecuting former Qaddafi regime officials in trials "that meet international standards of fairness will be a unique opportunity for national reconciliation for a community that wishes to have justice done at home in Libya." Al-Jehani said that a "rush to judgment" by the ICC would "render the principle of complementarity meaningless." Seif was originally charged alongside his father and the Qaddafi regime's former intelligence chief Abdullah al-Senoussi in June 2011 with attacking civilian protesters in the early days of the popular uprising against Qaddafi's rule. The United Nations Security Council had asked the court to launch an investigation amid widespread reports of human rights abuses by the Qaddafi regime as it fought to cling to power. Judges dropped the case against Muammar Qaddafi in November 2011 after he was captured and killed by rebel fighters. Al-Senoussi fled the country, but was later captured in Mauritania and extradited to Libya. A decision on where Seif al-Islam will be tried is expected to take weeks or months.